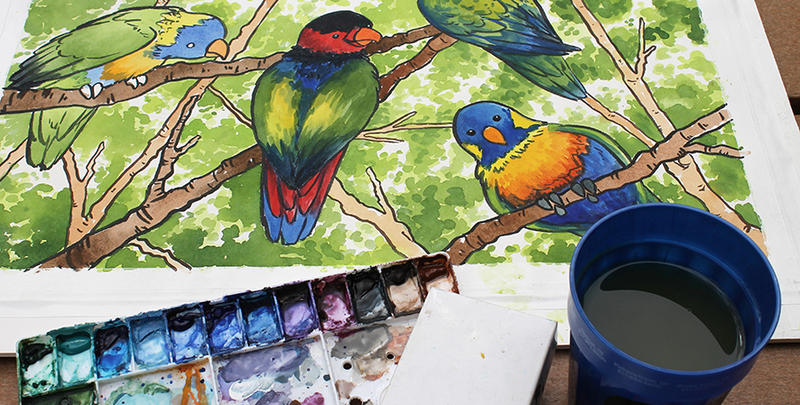 The Indianapolis Zoo’s annual event features painting for a fun spring activity. Photo Courtesy of Indianapolis Zoo. With spring around the corner in Indianapolis, there is plenty to do both when it’s raining and when the sun is shining. From indoor activities like escape rooms to outdoor activities like archery, there is plenty to do in Indy this spring. The Children’s Museum of Indianapolis Sports League Experience – The Sports League Experience boasts 12 outdoor experiences as well as three indoor exhibits. Tickets for both are included with a general admission ticket to the Children’s Museum. Access to the outdoor areas is weather permitting. Tickets range anywhere from $5 to $37 depending on the day. Indianapolis Zoo – The Indianapolis Zoo is hosting their annual xZooberance Spring Festival on Thursdays through Sundays until April 7. The festival is free with zoo admission and boasts crafts, photo ops, live music, animal encounters, a beer garden and refreshments. In addition to the spring festival, the zoo hosts a variety of chats, demonstrations, and presentations about the animals. There is also a new dolphin show and butterfly exhibit. Parks – Indiana has plenty of parks to hike in, picnic at and enjoy a variety of activities. Eagle Creek Park has several trails for hiking, a beach and swimming area, watersports, and a treetop adventure course. Fort Harrison State Park offers plenty of activities and events, including movies, free fishing days, hiking, a dog park and biking. They also have a Saddle Barn, where you can ride horses on the various trails around the park. Holliday Park has 3.5 miles of trails to walk as well as a nature center, playground, and their infamous ruins. White River State Park offers a variety of museums, outdoor art installations, and vehicles to rent including segways, surreys, pedal boats and kayaks. Earth Day Indiana Festival – Earth Day Indiana Festival will be held on April 20 in the Historic Military Park located in White River State Park. The free festival offers children’s activities, food and beverage vendors, as well as a 5K run/walk and a 1K walk. Both races will be held at noon. The 5K run/walk costs $30 and the 1K walk costs $25. Indianapolis Cultural Trail – The Indy Cultural Trail connects six cultural districts, making it one of the best places for a food or bike tour. Currently, the four food tours available are for those 21 years and older. The tours cost $55. The bicycle food tour costs $75 and includes a 24-hour pass to use the Pacers bicycles. All food tours guarantee at least five restaurants but can include as many as eight. For people who would like to tour the cultural trail but are under 21, trail tours are $35 and include bicycle and helmet rental. Koteewi Archery Range – Become Merida, Hawkeye or Katniss Everdeen and learn how to shoot arrows at Koteewi Archery Range. Lessons are $25 for 30 minutes and $40 for an hour. This includes the cost of renting equipment and an hour at the range post-lesson to perfect your newly acquired skill. They also do group events and parties. Skateland – Skateland has a 500-person capacity roller rink as well as an arcade and cafe. They host several discounted skates as well as special events and public skates. While admission is usually $8, it continually fluctuates between $1 to $8 depending on the event or promotion. The only consistent fee is skate rental, which is a $4 flat fee. Occasionally free pizza and drinks or discounts will come with the purchase of admission. Escape Indy – Gather some friends and try one of four “missions.” Each mission varies in difficulty from spy master to field agent and cadet. Three revolve around spy and CIA work while the odd one out involves a space agency receiving a distress call. X-Site Laser Tag – X-Site offers state-of-the-art laser tag as well as an arcade. They also have daily specials like all-you-can-play laser tag with a college ID on Thursdays or $5 laser tag offered on Fridays. Holcomb Observatory Tour – Spring fun doesn’t always mean traveling to a local neighborhood, park, or into downtown Indy. Butler’s own Holcomb Observatory offers tours of the observatory as well as a look through the telescope on the weekends. While viewing through the telescope is always free, the planetary show costs $7 for adults and $5 for children. Butler students, faculty and staff get in for free with their school ID. The Oddities and Curiosities Expo – The first traveling oddities and curiosities expo is coming to the Indianapolis State Fairgrounds on Saturday. The expo will feature all sorts of specimens, bone and insect jewelry, artwork, skulls, curiosities, sideshow performances and other oddities. General admission tickets are currently on sale for $10. ¡Festival de Musica! – On April 13 at the Paramount Theater, the Anderson Symphony Orchestra is hosting a celebration of music from Spain and Latin America. In addition to the orchestra, there will be dancers on stage performing traditional dances to the music. Tickets cost between $10 to $35. Broad Ripple Farmers Market – Broad Ripple hosts its Winter Farmers Market indoors until April on Saturday and features a wide variety of produce, baked goods, cheese, honey, etc. Starting in May, the location is moved outdoors for the Summer Farmers Market featuring the same, if not more, vendors.